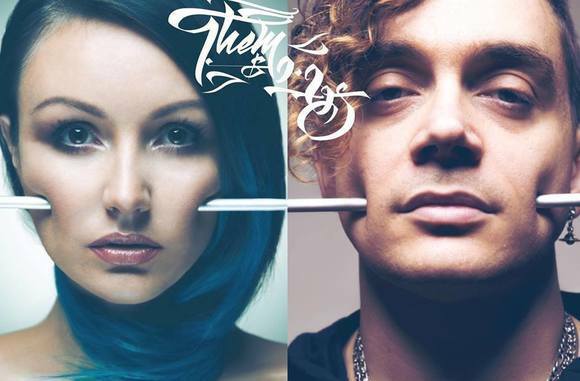 THEM&US BIO Equal Parts Rave and Tragedy - Thump/Vice Dynamic, Dramatic, Expansive - get it in your life”- Alex Baker/Kerrang! Comprised of Lee Michael (aka legendary beat-boxer Killa Kela) and former Basement Jaxx vocalist Ami Carmine, Them&Us have been described as a 'Game Of Tones' which, with their highly distinctive style, perfectly encapsulates their capacity to blend the ethereal, beautiful and melodic, with heavy beats, soaring synths and rumbling bass. Already described as ‘Massive’ and ‘Epic’ by UK radio heavy-hitters Alex Baker and Eddy Temple Morris, and with two well receved Eps under their belts in 2015, Them&Us picked up major radio support Stateside from the likes of KROQ and KCRW, and more recently winning award for Best International Act at the Toronto Independent Music Awards 2015. In late 2015, after finishing up shows with KROQ in Los Angeles, and a November UK wide tour supporting Australian band The Red Paintings, the year culminated with a sold out London show at the Electric Ballroom, Camden in December, supporting electro pioneers Does It Offend You Yeah? 2016, and a new live line up has already started to see the band round up new dates across the UK and North America.